How we treat and destroy wasp nests. Wasp nests & Hornet nest treatment methods & wasp nest removal. In spring when wasp nests undergo construction they are small and relatively easy to treat. However, later in the summer when the nest has started to develop and grow with many worker wasps helping to build and defend the nest, things begin to get a little more serious. We urge you to forego any attempts at trying to knock an active wasp nest down, or (in some outrageous cases) set fire to a wasp nest as the outcome will not be pleasant. A nest knocked to the ground will break apart quickly, and and the contents of the nest will become exposed, in this case, it will be lots of extremely angry wasps looking for revenge. We strongly advise that you do not try and block the entrance to a nest. We have regularly attended blocked nests where the customer has used duct tape or even worse, expanding foam and the results are not pretty. Wasps that have their nest entrance blocked do not just give up and die; instead, they become agitated and will find another way out. Wasps are capable of chewing their way through a wall or ceiling, and in the worst case scenario they end up inside the house. Wasps returning to a nest that has had its entrance blocked will similarly look for another way inside. Do not use expanding foam to try and kill a wasp nest or block the entrance. You will cause more problems than you will solve. Setting fire to wasp nests. Do not to set fire to a wasp nest. 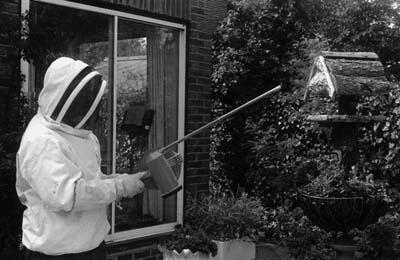 You will not kill all the wasps using this method, and apart from it being a fire hazard, it will also trigger the wasps to attack and sting. Wasps are highly defensive of their nests, and any threat to the nest or their young will provoke an attack. Wasps when under threat, emit a pheromone triggering the other wasps to join in the attack, this happens extremely fast. If you have a ground wasp nest, it is tempting to put the hose down the hole, switch the tap on and walk away. This rarely works out. The surrounding soil soaks up most of the water before it can reach the nest and the outcome is a waterlogged lawn. The product used during a professional wasp treatment is generally in a powder form. The application of dry powder to soaking soil forms a paste that will not have the desired effect. Professional treatments of Wasp nests. 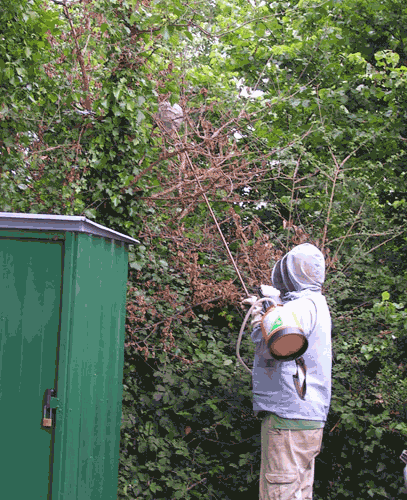 Once we have established that you have an active Wasp or Hornet nest, we can arrange to visit your property. We will identify the entrance points to the nest and apply an insecticide to these entrances in the form of a white powder (this insecticide is not available to the general public and is for professional use only). The wasps on returning to the nest will come into contact with the powder, and they help distribute the insecticide inside the nest. In some cases where the entrance to the wasp nest cannot be easily located, or access is restricted (most usually on very tall buildings) the nest will need to be discovered and physically injected with the insecticide, this is generally carried out within the loft space of a building. The insecticide is fast acting, and the nest will become inactive by the end of the day (typically faster) when all foraging Wasps or Hornets have returned to the nest. We advise customers to stay clear of wasp nests for a period after treatment as sometimes the application of the insecticide can agitate the Wasps for a brief while. Wasp stings can produce an Anaphylactic reaction to some susceptible people and in some extreme cases can be life-threatening. Some people are at risk from anaphylaxis and are entirely unaware. Anaphylaxis is an allergic reaction to a substance; this can be foods, medicines or insect venom. With this in mind, the best course of action is for no one to get stung while dealing with a wasp nest. A professional and experienced approach is best. We have specialists tools and protective clothing that enable us to reach awkward wasp nest entrances safely. If a wasp or hornet nest is in a loft space and access to the nest entrance is not available outside, then we have telescopic lances which enable us to reach the nest within the loft space without getting dangerously close. Treating nests in loft spaces can be particularly tricky with the confined spaces involved and lack of rapid exit opportunities. We advise customers that Wasp nests do not need to be taken away once treated or if they have died naturally. Some situations dictate otherwise, and we will provide a wasp nest removal service in certain circumstances. The reason we do not typically remove nests after treatment is simple: wasps by their very nature are foragers, and most of the adult wasps are out of the nest during the day looking for food, water and nest building materials. After a nest treatment, it takes time for all these foraging Wasps or Hornets to return to the nest where the insecticide will be waiting for them. If we were to remove a nest before all the wasps have returned, there would be a build up (residue) of Wasps looking for the removed nest, and they will have nowhere to go and could become aggressive. In some cases, they rebuild the nest. If a nest needs removing for whatever reason, it will require treatment in the usual manner, and once all the wasps have succumbed to the insecticide, we can then remove the nest safely. If you require us to return and remove a treated nest, we do charge the standard fee of £45.00 as we have to make a return visit. Most nests are left in their current position as wasps do not re-use a nest from a previous colony or an old nest from a year prior. Occasionally a new nest will be built next to an old one, the only reason for this is the location is an ideal one for Wasps. We have never attended wasp nests that we could not treat. Please note: Due to the decline in our native Bees we do not treat colonies of Honey Bees. If you find yourself with a Honey Bee swarm, try and find a local Beekeeper or a swarm collector, they are usually more than happy to come and collect a swarm of Bees free of charge. We do not treat Bumble Bees as these can generally be relocated if they are a problem (contact your local beekeeping society for instruction). We do not treat Mason bees and Mining Bees which are harmless bees and excellent pollinators that are unlikely to sting.